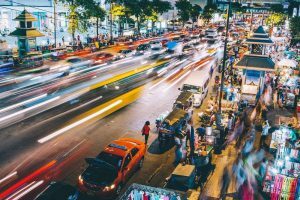 While Bangkok is home to a whole host of markets selling everything from clothes and souvenirs to fish and fried goods, Maeklong Railway Market on the outskirts of Bangkok offers travellers something slightly different. 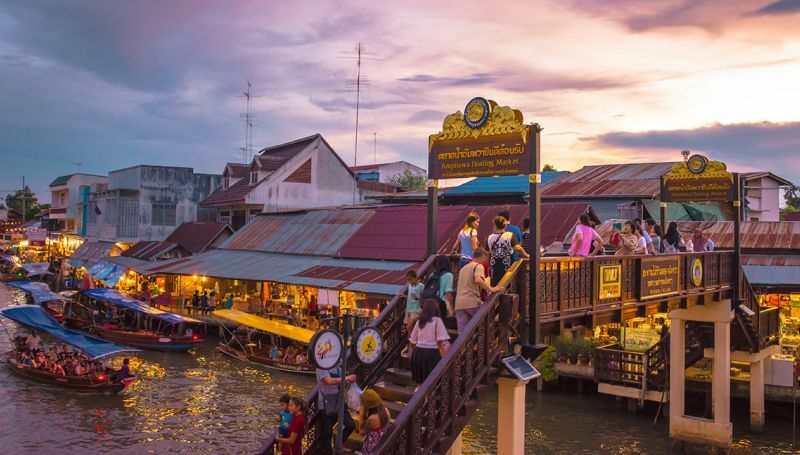 Read on to find out everything you need to know about Maeklong Railway Market including how to get there and what makes this market so special. 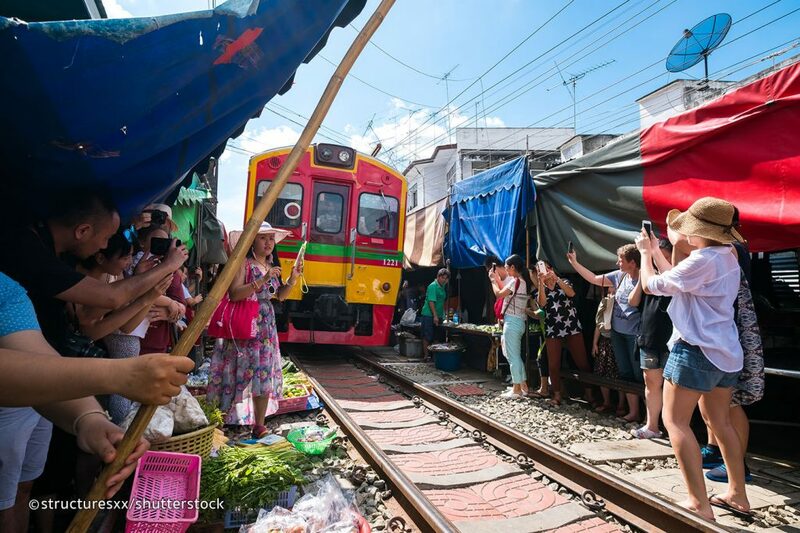 What Makes Maeklong Railway Market Special? 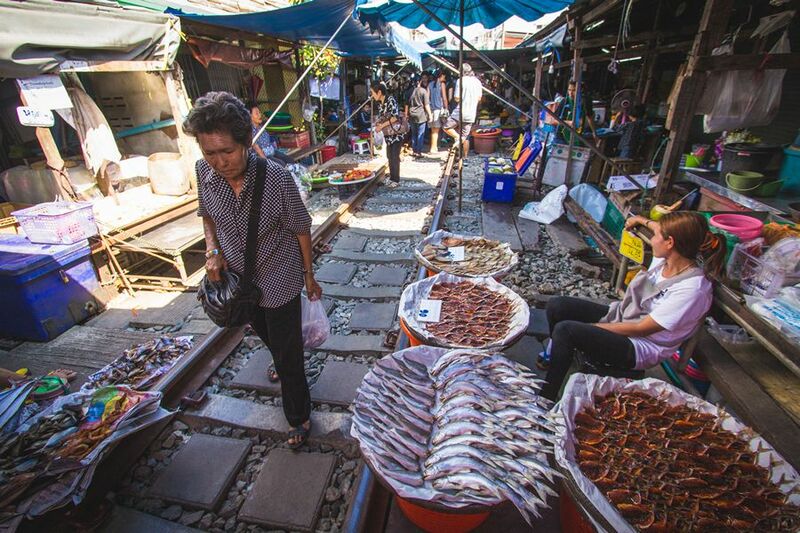 Maeklong Railway Market is a bustling market with stalls galore set out upon the railway tracks. The funny thing is that these tracks still support trains which run through the market eight times a day! Just before each train rumbles through the marketplace, the stall owners up sticks and shuffle their wares a few feet backwards to allow the train to pass before moving back into their original position on the tracks! This is a totally different experience to any standard market you get across Asia and is well worth a visit. Thanks to the region’s proximity to open water, the Maeklong market has specialised in fresh seafood for over a century. The market was founded in 1905 (before the railway line was introduced) and has continued throughout the years despite the changing landscape. Whereas most markets would move location when a trainline cuts right through the middle of it, these guys just decided to work around it! 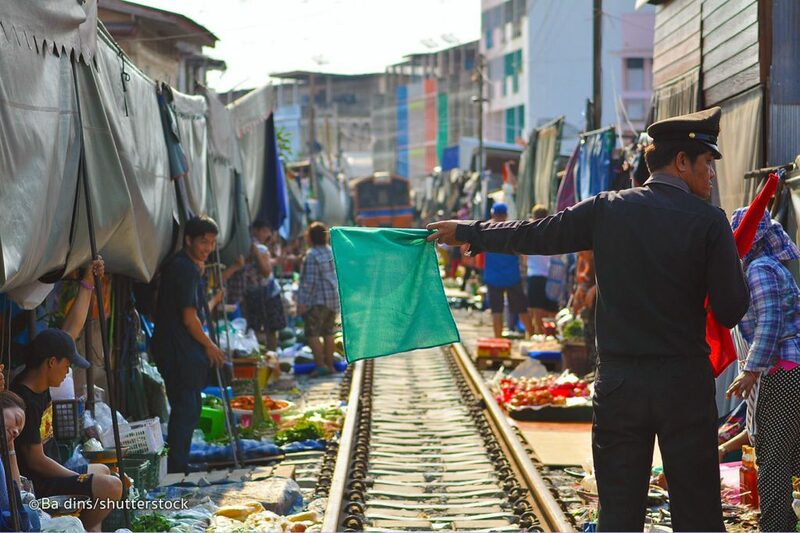 Where is Maeklong Railway Market? The Maeklong Railway Market is located in the province of Samut Songkhram and takes between 1-3 hours to get there from Bangkok city centre depending on your mode of transport. 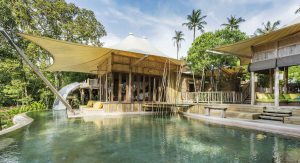 Alternatively, you can stay in or around Maeklong if you want to extend your experience of local life in Thailand. How do I get to Maeklong Railway Market? There are a few options on getting to the Maeklong Railway Market and these include bus, train, taxi and private tour. The bus to Maeklong leaves Bangkok from either Mo Chit bus station or the Southern Bus Terminal (Sai Thai Mai bus station) and will only set you back a couple of dollars. The journey takes around 90 minutes and leaves every 40min-1h so you can go and come back in a day. 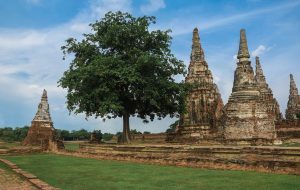 If you want to make the most of your train-centred day you can catch the Maeklong railway from Phak Klong San in Bangkok to Maeklong station or take a train from Wongwian Yai Railway Station and change at Mahachai Station (Mahachai Pier) to head on to Maeklong. These journeys take longer (around 2.5 hours) but will certainly add to your experience. 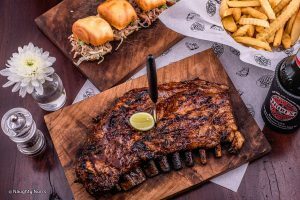 A taxi will obviously be the quickest option but is likely to set you back a little more, but if you want to come and go as you please this can be the best choice. As long as you ensure the driver uses a meter or you agree a set price before you travel you should be ok. Finally, using a private tour guide is great if you want to gain a little more insight into the history of the market and to receive some cool information about the produce and products on sale! 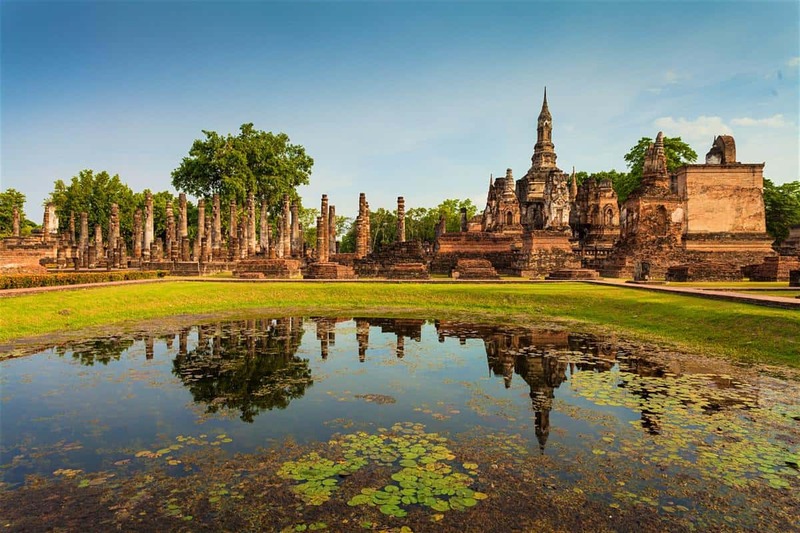 These can be arranged to and from Bangkok and are perfect if a group of friends are travelling together. If you have a day to spare during your time in Thailand, the Maeklong Railway Market is a one-of-a-kind experience that is not to be missed. The market provides awesome photo opportunities and while there is more pungent seafood available than quirky souvenirs, you’ll still be in for a treat. If you do want to make some purchases, check out some of the tasty Thai desserts and fresh tropical fruit!